Orange Sherbert Cake is perfect for the summer! It is so light and refreshing, not to mention, very easy to make! There are only a few ingredients and there is no baking involved. Recipe below. Beat the whipping cream with the sugar and vanilla until fairly stiff. 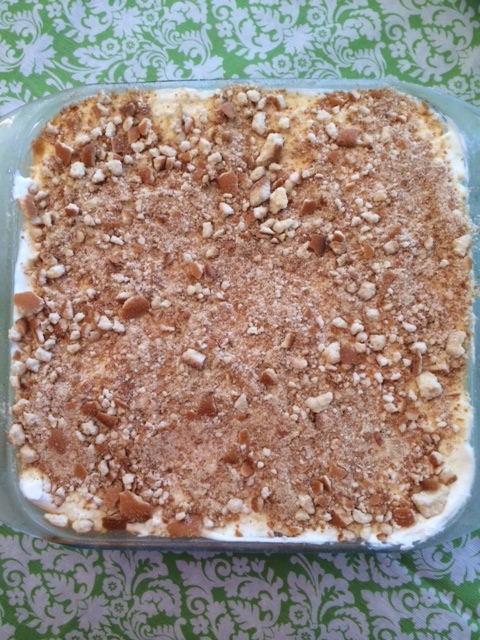 In medium bowl, combine 1 cup of the whipped whipping cream with the crushed Nilla Wafers, (reserving 1 cup of the Nilla Wafer crumbs for the top). Spray the bottom of a 9 x 13 glass pan and press the cookie crust mixture on the bottom. Spread softened sherbert over the top evenly. Spread remaining whipped whipping cream over sherbet. Sprinkle remaining cookie crumbs over the top and freeze. Let set in freezer at least 3 hours before serving. This is so delicious! It has a creamsicle taste to it with the orange sherbert and whipped cream combination. The crust is just perfect. I don’t really know how anyone could not like it.